Settlling in for the evening; Charlie's Camp, Larapinta Trails (photo: Graham Freeman). The majestic West MacDonnell Ranges, aka the West Macs, are home to some of Central Australia’s most spectacular scenery, including some truly amazing waterholes and hidden gorges. Here’s some of the best spots to go. The West MacDonnell Ranges (the locals just call them the West Macs and so shall we) snake almost 200km west of Alice Springs towards Kings Canyon, and are an accessible snapshot of all that’s good and impressive in the Red Centre. Think painter Albert Namatjira in situ: spinifex, ghost gums, dry creek beds and rocks as red as sunburn. Stunning to look at from the road that winds past them (also known as the Red Centre Way) the mountain range is nicked and notched with gorges and chasms the most intriguing locations are hidden within the weathered rocky peaks, so allow plenty of time to explore them. Places like Emily Gap with its shallow pools and flocks of green budgerigars, Standley Chasm with its glowing red rock walls during the midday sun, Ellery Creek Big Hole with its interesting dolomite rock formations and refreshingly cool (bordering on icy) swimming hole, and Simpsons Gap with its black-footed rock wallabies wandering about are must-see spots. Historic Hermannsburg, former Lutheran Mission and once the home of Aboriginal watercolour artist Albert Namatjira, is well worth visiting, as is Glen Helen Gorge with its charming bare-bones resort and campground. Ormiston Gorge (135km west of Alice Springs) is another unmissable spot, famously swimmable year-round. There’s an easy trail from the Ormiston Gorge car park, but more rewarding is the 8km Pound Walk (it also leaves from the car park) that climbs to a ridge-top lookout over Ormiston Pound, an unexpected circle of peaks amid the otherwise unbending lines of the West MacDonnell Ranges. Crossing the pound, the track funnels into Ormiston Gorge, wandering beneath rust-red cliffs topped with ghost gums like blond implants, and past permanent waterholes up to 14m deep. There’s a gradual climb up to the lookout, and some ankle-turning rock hopping through the gorge entrance, but otherwise the walk is mostly flat and simple. Midway through the gorge, beside a waterhole, turn uphill onto the Ghost Gum Walk, which climbs to the top of a bluff where a lone ghost gum overlooks the snaking crevice of the gorge. Getting amongst the Mount Sonder descent, Larapinta Trail (photo: Graham Freeman). Mount Sonder’s another special spot: it’s 1380m high and it’s you can climb to the summit via a good trail and the walking and photographic opportunities of Finke Gorge National Park and Palm Valley are without peer. Don’t miss the 142-million-year-old Gosse Bluff asteroid impact crater, west of Hermannsburg. Did you know? // The Finke River is thought to be the oldest river in the world, with sections dating back as far as 300 million years. It’s usually a long collection of disparate waterholes, except in rare times of flood. Other things you can expect to see: roadside scrub decorated like Christmas trees with discarded, broken car bits, a camel or two, surprise mountain ranges and more vegetation than your school-teachings would have had you believe was out here. Also expect your teeth to chatter and your fleshier parts to vibrate from the corrugations in the road, especially if it hasn’t been graded recently. The Simpson Gap bike path is a pleasant, easy ride best enjoyed between April and October, when days are cooler – no matter how fit you are, please don’t tackle this in high summer. The path is 17km one way from John Flynn’s Grave to Simpson Gap. Families should allow four hours to complete this stretch, stopping to enjoy a picnic and take in the views along the way. You’re likely to see lizards and wallabies en route. Alice-based Outback Cycling rents out bikes. Mountain bikes, kids’ bikes and bikes with baby carriers are available, and the staff can suggest suitable routes. Avid cyclists can turn the ride into a 48km endurance test by starting in Alice and taking the bike path west for 7km to Flynn’s Grave, doing the return Simpson Gap ride, then heading back to Alice. Take a bike ride on rough terrain on the Araluen Mountain Bike Trails. The Central Australian Rough Rider Mountain Bike Club conducts social rides along 15km of fire trails and single tracks. Suitable for advanced, intermediate and beginner riders. The Larapinta Trail is just over 220km long and follows the West MacDonnell Ranges from the Telegraph Station in Alice Springs to Mount Sonder. The best time to tackle this rugged track in full is between June and August. It is not recommended from October to February. The trail is broken into 12 sections of 9-29km, so you can do a section a day. The longest day’s hike is about 10 hours. While the track is well signposted, planning your trip well is vital – there are no convenience stores along the way. There are tanks at each trail head to top up your water and you can organise food drops. Rock climbers will find plenty of crags to conquer in both the West and East MacDonnell Ranges. They may not be the grandest of peaks, but they are pretty spectacular for bouldering and climbing. Grab a copy of Rock Climbing in Central Australia by Krish Seewraj, online at Open Spaces bookstore. 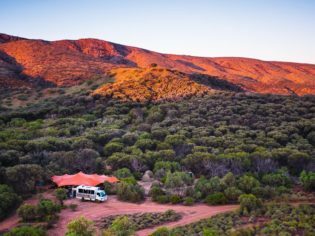 Sitting at the western end of the MacDonnell Ranges, Glen Helen Resort has very basic motel style rooms – but on the plus side, you can get bunk rooms that sleep four from $35 per night per person and there’s a campground as well. The resort’s Namatjira restaurant has croc, kangaroo and barramundi on the menu. Its outback-style bar is a bit of fun, with a back deck overlooking a formidable wall of red cliffs. There’s heaps of accommodation in Alice Springs, but if you want to get out amongst it, take your tent. Redbank Gorge offers two campsites with basic amenities (ie, pit toilets). 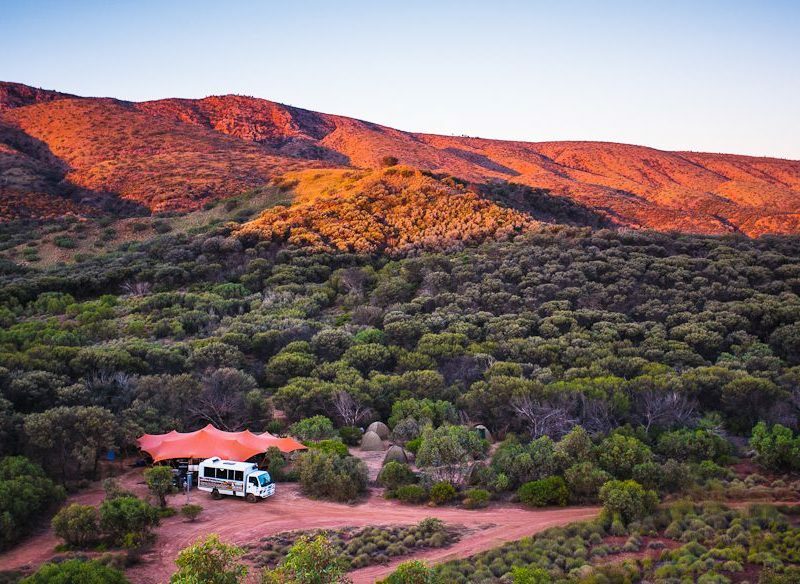 This tranquil campsite is 156km from Alice and about 5km along a dirt road off Namatjira Drive (4WD recommended). There are gas barbies at the first camp you come to, but the second camp has amazing views to MountSonder. You can also camp at Ellery Creek Big Hole, but you’ll no doubt have to share this beauty spot with others. For info on campsites and how to obtain permits, go to nt.gov.au.